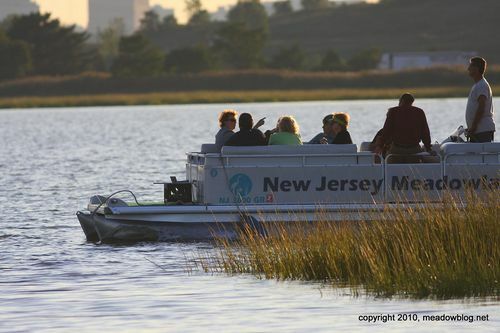 Another season of the Meadowlands Commission's popular eco-cruises and guided canoe trips begins in May, but you can start reserving a spot now. Today we are posting information on the pontoon-boat eco-cruises. We'll post the canoe info on Wednesday. The cruises leave from the River Barge Park in Carlstadt. The weekday and weeknight cruises last two hours, and are for people ages 10 and up. Suggested minimum donation per person is $15. Pre-registration is required. The link to pontoon-boat schedule and registration form is here. 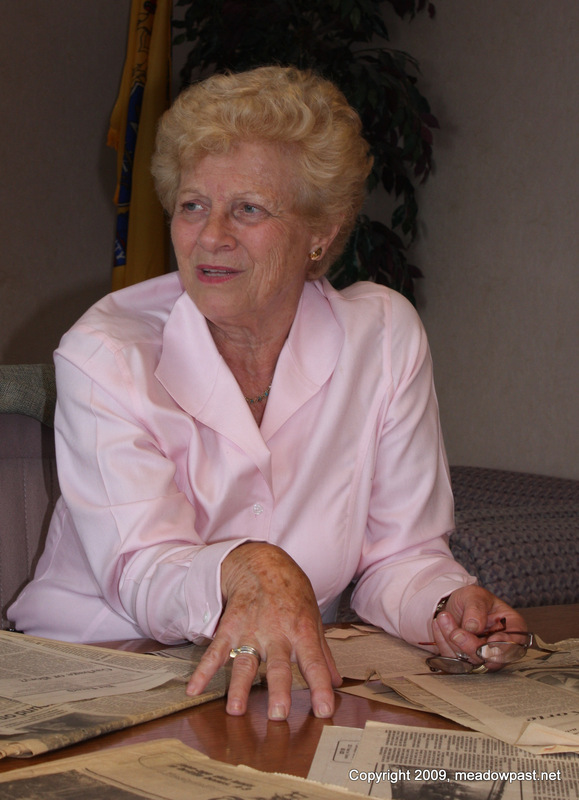 We recently interviewed Paulette Ramsey, who talks about her late husband, Richard W. DeKorte, and his foresight and contributions to the Meadowlands. 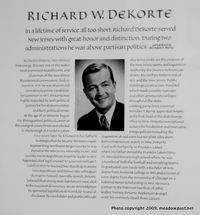 As a state assemblyman in the late 1960s, DeKorte was instrumental in crafting the legislation that created the New Jersey Meadowlands Commission. DeKorte Park is named in his honor. DeKorte also laid out the foundation for the region’s environmental restoration and economic development over the past four decades. He also laid out the foundation for the region’s environmental restoration and economic development over the past four decades. In the interviews, Mrs. Ramsey talks about her late husband’s foresight and contributions to the Meadowlands, as well as NJMC’s collaboration with Ramapo College and the district today. A plaque (above) in the lobby of the NJMC Administration Building at DeKorte Park honors his memory. Getting to many of the New Jersey Meadowlands locations can be tough — but we are trying to simplify the task. At the upper left-hand corner of this blog, we are posting links via Google Maps that enable you to type in your address and get directions to DeKorte Park in Secaucus and elsewhere. Note: With most of these Internet mapping sites, Google maps may not list the best option as the first option. Try alternate suggestions, and look at the map to get a better sense of where you need to go. The William D. McDowell Observatory at DeKorte Park now sports a Geochron Global Time Indicator. 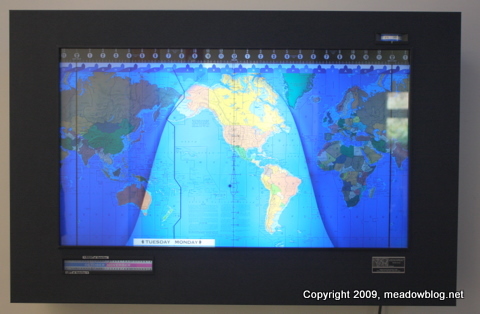 It not only tells the time around the world, but it also shows where it is daylight. Acting on a heads-up from the New Jersey Audubon Society's Pete Bacinski, we went looking for a Northern Wheatear (reportedly seen on Monday in DeKorte Park) as part of an afternoon exploration. 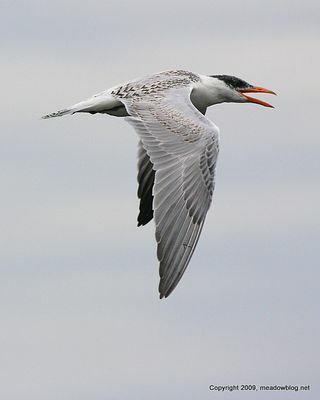 We took this photo, ran it past a couple of birding buddies for confirmation (thanks, guys! 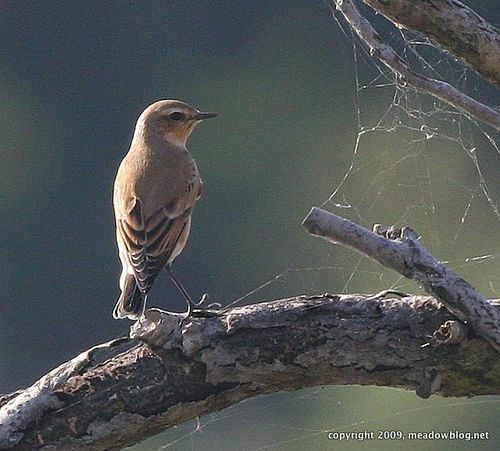 ), and we are happy to report a Northern Wheatear sighting at DeKorte. If you happen to see this early enough, we are having an impromptu walk at DeKorte Park at 8 a.m. to look for the bird (and check out the new big-league mudflats in the Shorebird Pool). Park in the first parking lot and meet at the entrance to the first building on left, the Environment Center. More on Northern Wheatears here. Call Jim Wright after 7 a.m. at 201-785-6604 if you directions, etc. We visited Anderson Creek Marsh recently and found some exceptional birding. We saw hundreds of peeps, a few Caspian Terns, several Yellow-crowned night herons, plus Snowy and Great Egrets and yellowlegs. We also saw a Northern Harrier have a run-in with several terns — all in all, a good day to be on the marsh. 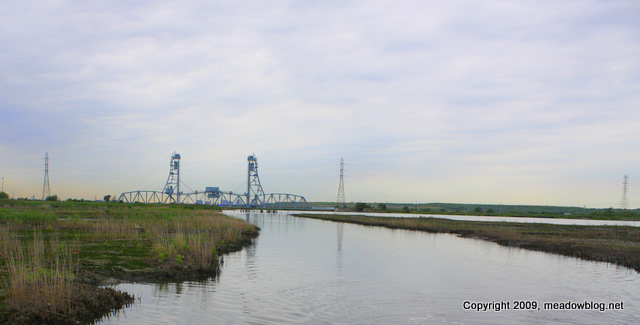 The marsh is located on the Hackensack River just south of Harmon Cove in Secaucus. For more information on Anderson Creek Marsh, click here. For more photos, click "Continue reading…"
This shot and the ones on the "jump" of this post were taken from a digital camera attached to a tethered helium-filled balloon. To see a video of how MERI achieves these amazing shots, click here. More posts on MERI are here. MERI's home page is here. 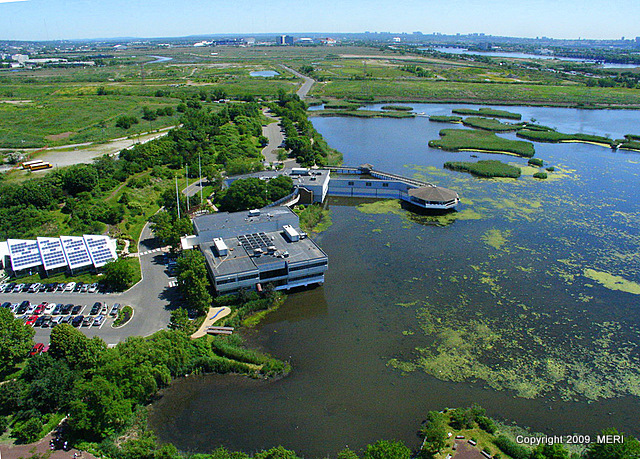 Click "Continue reading…" to view another photo of the NJMC campus at DeKorte, as well as the Saw Mill Creek WMA tidal mudflat. The wild Monk Parakeets of Ridgefield look to be doing well. We stopped by to check in on them last week and found more than two dozen sunning themselves in nearby trees. It seemed a bit odd to see a parakeet on a tree with dead leaves, but that is the way it is in this region. 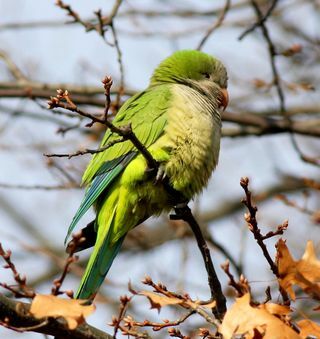 Karen Riede of the town's Environmental Committee says the Monk Parakeet population is around 30– as it was last year about this time — and that the birds are perfectly acclimated. "They all grew up right here, and this is the only home or environment they know," she says. The birds have been in Ridgefield, Edgewater, Fort Lee and other spots for so long that there is a strong likelihood that this beautiful, colorful (if a tad loud) bird will be to the state list. A prevous post on the parakeets is here. The second Harrier Meadow walk for November was cold and a bit windy but sunny. Five hearty Harrier fans fought the chill for two hours to see more than 30 species. According to NJMC Naturalist Michael Newhouse, "We had an excellent view of an Orange-crowned Warbler. We also had 8 species of waterfowl, several Northern Harriers, a Bald Eagle, and Fox and Savannah Sparrows." Click here for other Harrier Meadow postings. Click "Continue reading…" below for the full list. 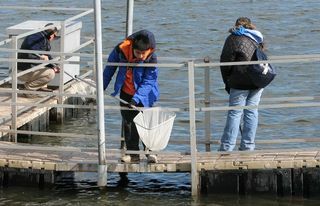 Seventh- and eighth-graders from the Belleville Middle School's Science Club took aquatic samples at the tidal impoundmen t at DeKorte Park last week, and came up with a pipefish, grass shrimp, and killifish. We photographed the critters in the NJMC Center for Environmental and Scientific Education, where MEC educator Joe Sarnoski talked about the critters and the center's resident diamondback terrapins, including the 25-year-old Stinky. Click "Continue reading…" for more photos and info on what the students netted.